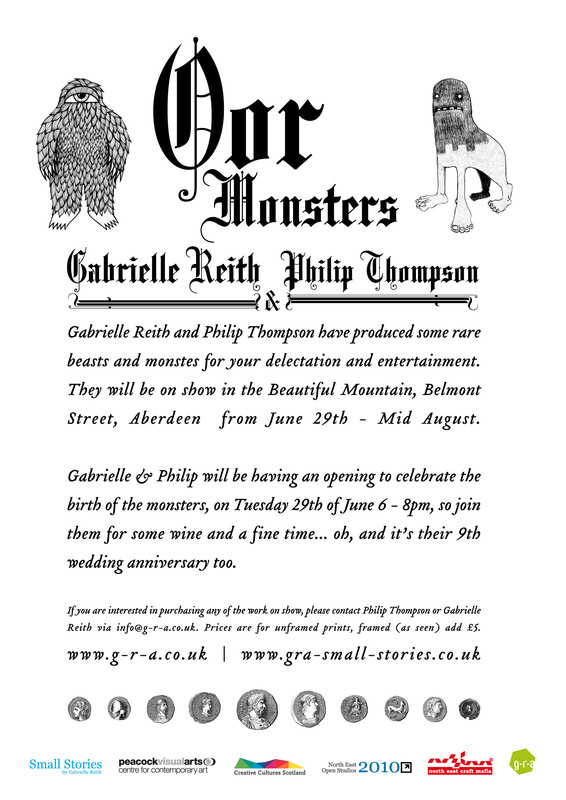 Oor Monsters is an ongoing collaborative project with husband & wife team, Philip Thompson & Gabrielle Reith. 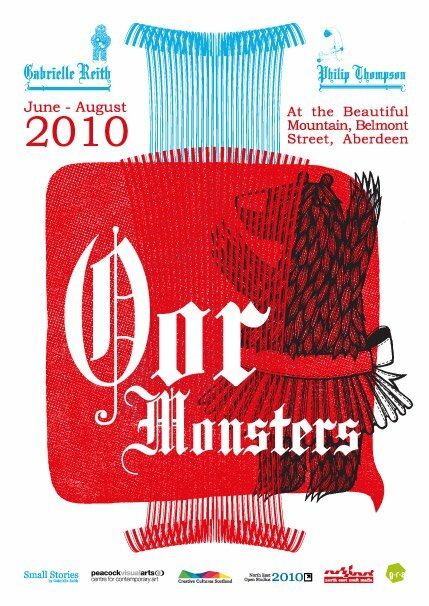 Oor Monsters started life as an idea for a print show they had at Aberdeen’s “Beautiful Mountain” cafe in 2010. 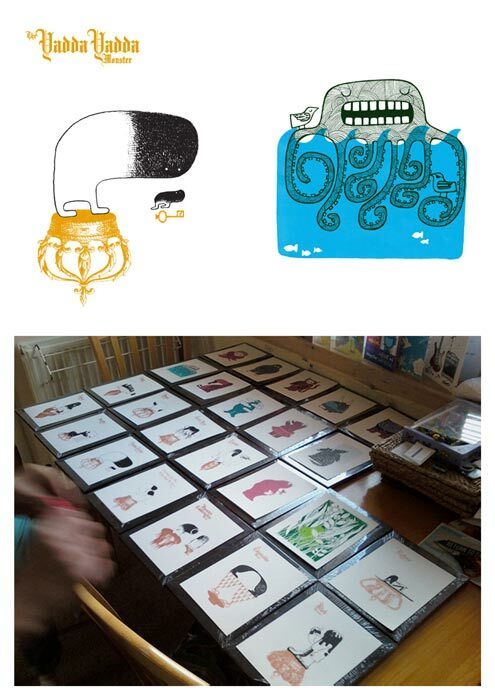 Gabrielle & Philip each produced a set of A5 2 colour screen prints, Gabi opting for Greek Mythologies / “Classic” monsters & Philip explored “problems as monsters”, where creations such as the “one sided conversation monster” and the “Stain monster” came to life. The show was well attended & garnered very positive reviews from attendees. 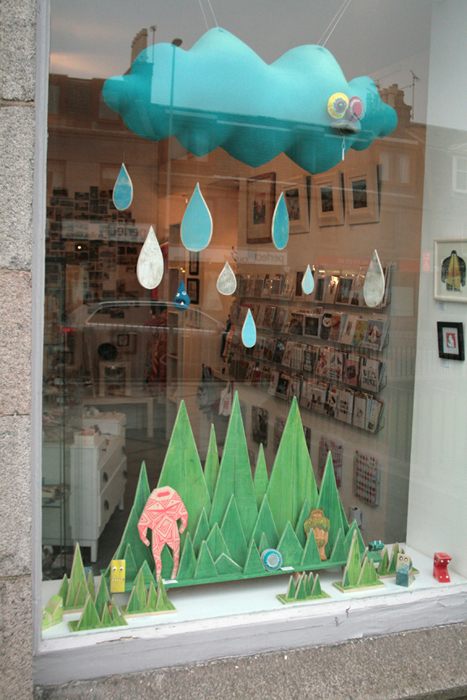 Building on the success of “Oor Monsters in the Beautiful Mountain” Gabrielle & Philip submitted work to the wonderful Pictoplasma, who put a call out to illustrators & creatives for ideas on “the missing link” (characters inspired by the Yetti) for their Paris Show at la Gaite-Lyrique. 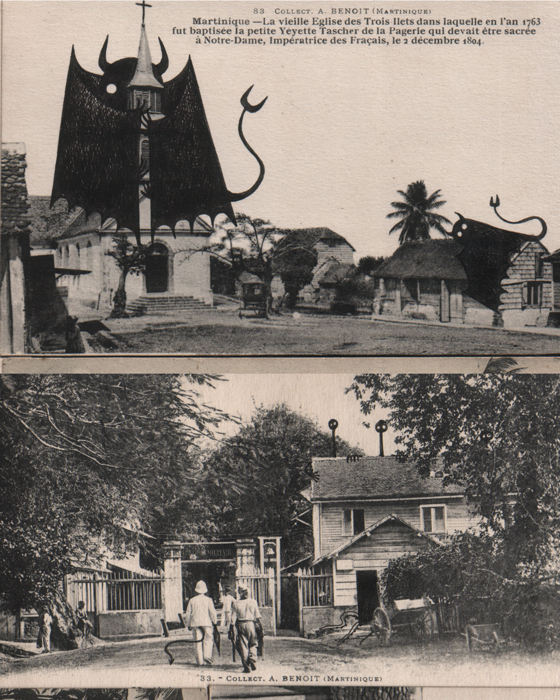 Both Gabi & Phil were successful, and shown with many other world class illustrators. 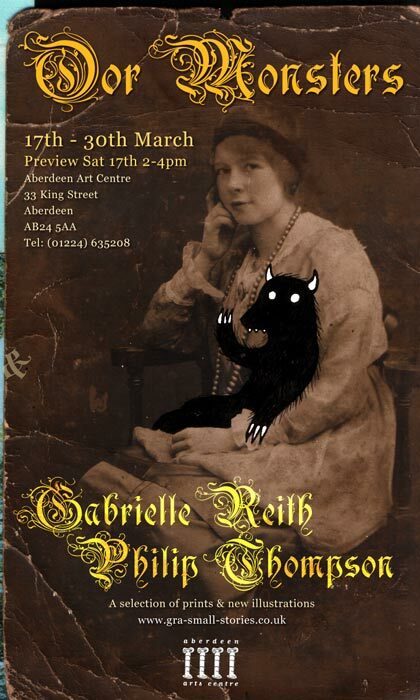 Brimming with confidence Gabi & Phil approached the Aberdeen Art Centre (ACT) to host “Oor Monsters II”. 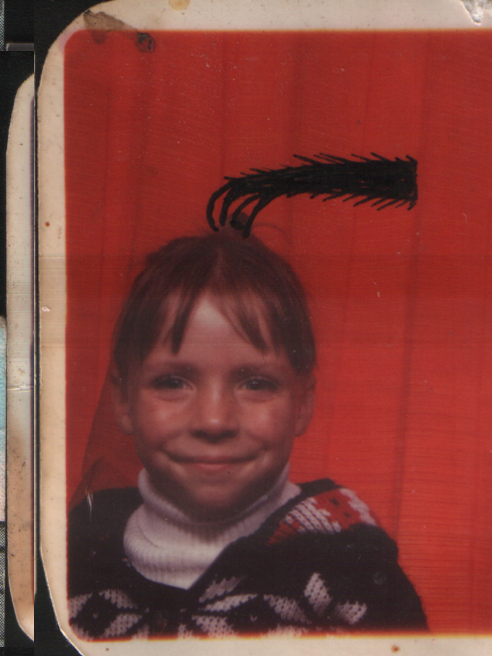 Act gave Gabi & Phil the space to try more experimental works. 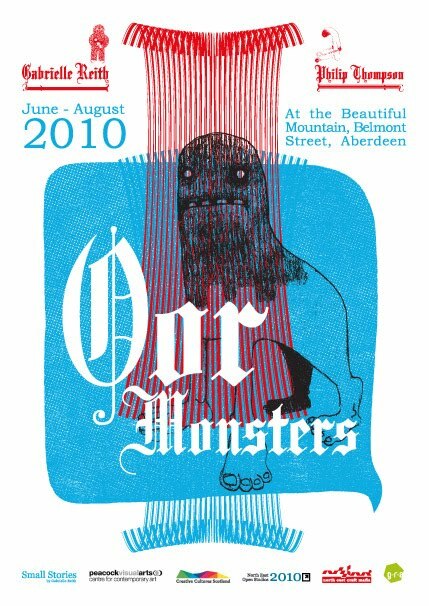 Constructing 3d aspects & more “installation” based work, the Oor Monsters II was again well received & admired by all that came. 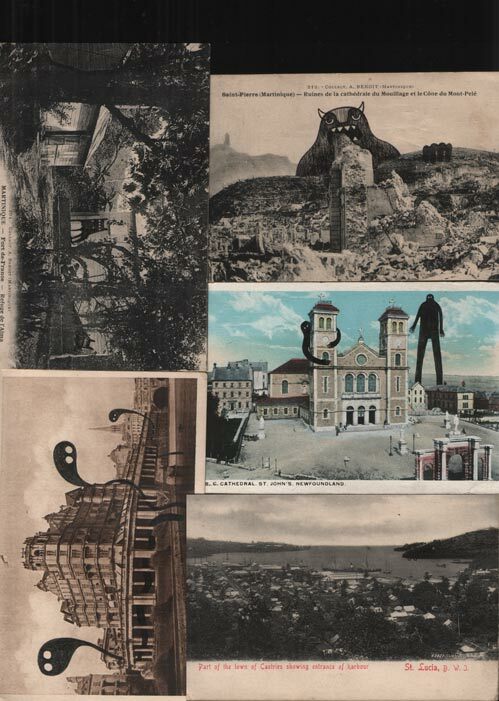 The work was commented to be “something very different for Aberdeen”. 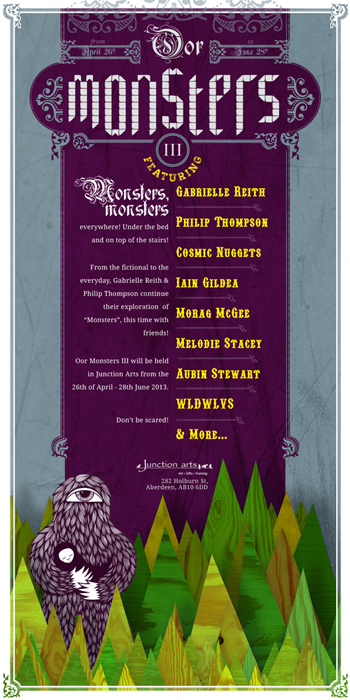 Opening up the Oor Monsters project to other Aberdeen Based illustrators, Gabi & Phil worked with Junction Arts to create Oor Monsters III. This show invited Cosmic Nuggets, Iain Gildea, Mags Gray, Kate Guthrie, Morag McGee, Melodie Stacey, Aubin Stewart, Max Stewart & Stu Awesome to Join Gabi & Phil to explore & create new works, with a fun monster theme. 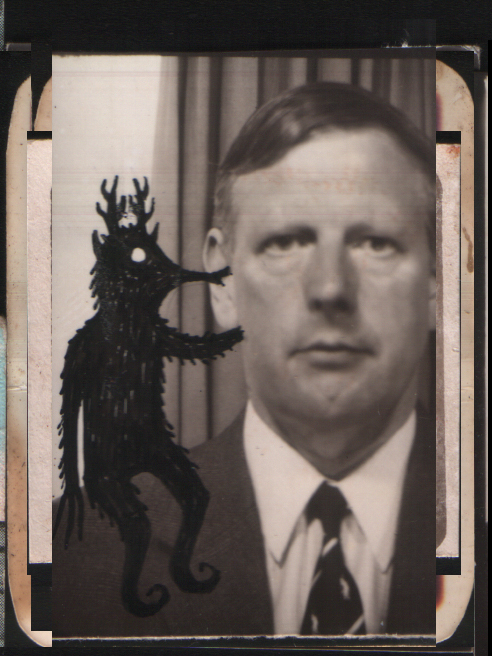 Jon Reid (Mood of Collapse) did a brilliant photographic documentation of it, check it out! 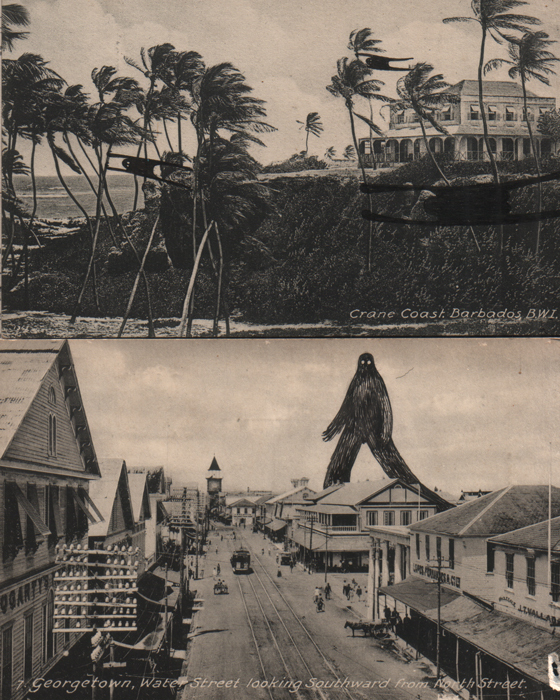 Oor Monsters VI (June 2018) is taking shape as a newspaper for the “look again” festival. Curated & created by Gabi & Phil, it will include their usual unusual look at normal things in a monstrous light, as well as having fantastic contributions from local & national illustrators & creatives. The paper will include “spy glasses” for all good citizens to use to document & report their findings of any unusual “goings on” in Aberdeen during the festival.